For those who may not be familiar, Doctor Who is a British sci-fi drama, and it is shot right in Cardiff and earlier this year the makers opened a fan experience show. I was so excited to see it from the moment we bought our tickets. By the time we arrived there were already a large number of eager fans of this cult program gathered. After we were greeted by friendly staff we were guided into a darkened room with a wide screen on already playing the famous Doctor Who opening theme. There was an excited buzz around waiting to see what happens next. The opening scene started with Doctor Who's voice guiding us into this adventure through time and space, taking in the history and scenes of the current Doctor Matt Smith. The film finished with what appeared to be an old crack in the screen on the wall opening up to reveal a secret door into another room! That was a great touch, so unexpected. As we entered we were already on a different planet and this kooky creature from Gallifrey was talking to us and even mocking us, calling us all ''shoppers'' and was asking for our help in getting him out of his prison. Well, who can say no to the adventure?! Then he guided us to the Tardis. Some of the lucky visitors even got to fly it and move it about in space (hydraulics did help :). Then somehow we got trapped by Daleks, we fought them through and managed to escape. Then while we were running away we were given 3D glasses that helped us fly through the a vortex. We were confronted by Dr Who baddies including Weeping angels attacking us but we were brave enough to find and rescue The Doctor! So after being a part of this exciting episode we went on to see the exhibits with all 11 Doctors, lots of montors, the Tardis and more views inside the Tardis. We had a silly photo taken in a green room which superimposed us onto a scene from Dr Who and at the end was a Gift Shop selling all kinds of Doctor Who collectibles. 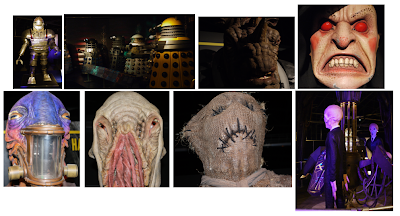 I would say that visiting BBC Doctor Who Experience is a must thing to do if visiting Cardiff Bay and it was great for fans like us, being children at heart.